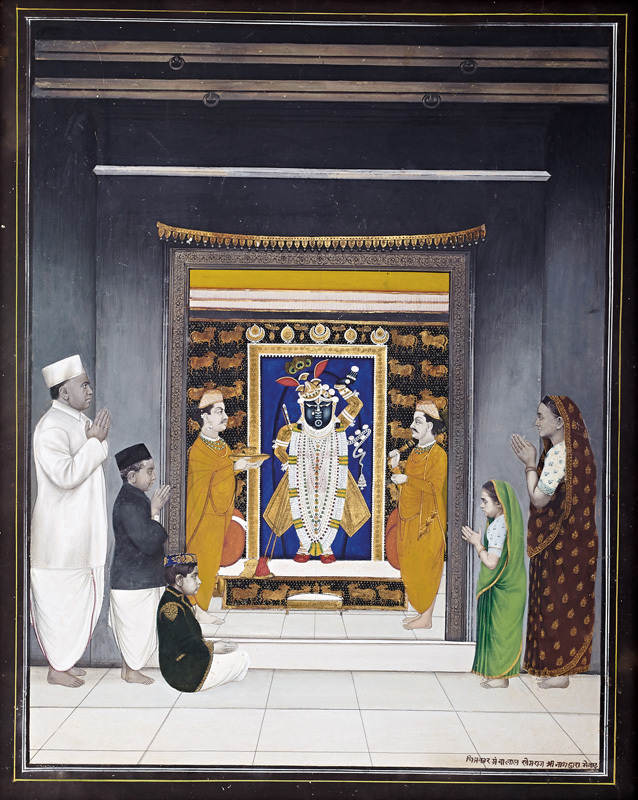 In this painting of a manorath, the entire family is depicted in profile. The pichwai at the back depicts golden cows on a black background. Govardhanlalji is shown performing aarti with Damodarlalji holding the fan. This is a painting by Ambalal Khemraj of a manorath on the occasion of Gopashtami. Ambalal was of the Jangir-Palaicha clan of artists and was a direct descendent of Pitha who settled in Nathdwara in 1705. Unlike other artists who would travel to different towns for commissioned works, Ambalal followed his father’s tradition of staying only in Nathdwara and working from there. His brother, Jairam and son, Radhakrishna, were acclaimed artists in their own right. Ambalal was also a photographer and a group photo of various artists and persons of Nathdwara clicked by him have been published in “The Artists of Nathdwara”, a book by Tryna Lyons.